I-CAR will offer a hands-on MIG brazing course in January — and even cosmetic collision repairers might want to take note, an expert said. MIG brazing, which allows joining at a lower heat, is useful for vehicles with ultra-high-strength steel (typically 781 MPa or higher). That light, strong metal and other high-strength automotive steels weaken when heat is applied. Because of this, OEMs restrict repair procedures on high-strength steels, and auto body shops have even fewer options once the UHSS threshold is reached. When OEMs say “no sectioning” or mandate certain types of joining, it’s not a gauntlet for your technicians to try and overcome. Tech skill is irrelevant to whether such a procedure can be accomplished safely, Honda collision instructional designer Chris Tobie said during a Guild21 call last week (see slides). “It has to do with physics and heat,” he said. Though UHSS steel is a staple of automotive bodies — B-pillars, roof rails and rockers/sills are common locales — repairers should note that it could still impact external repairs. 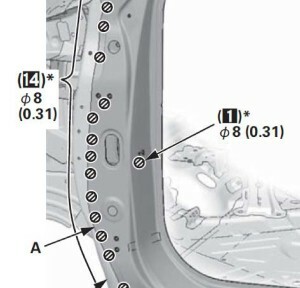 Since the 2014 model year, the Acura MDX has connected 270 MPa outer panels to Honda’s 1,500 MPa door rings, according to Tobie. Attaching the panel to the ring in a shop requires about 40 MIG-brazed joints. 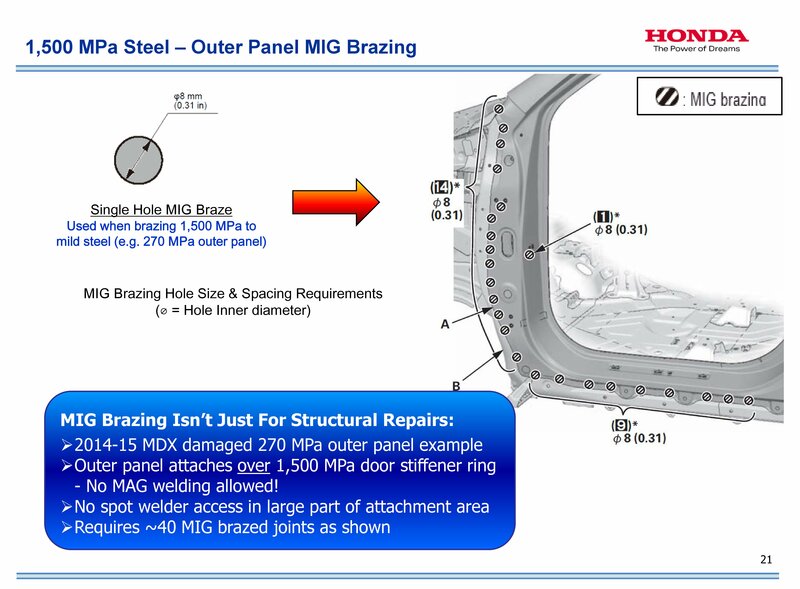 Spot welding (which Honda does allow on some UHSS parts, including on the MDX) isn’t possible in the space. Honda first required MIG brazing at the outer panel level on the 2009 Acura TL. It has since expanded the procedure to the panels of other vehicles besides the MDX as they undergo full model changes, according to Tobie. You’ll need to check the most current body repair manuals for the particular Honda or Acura model year you’re fixing to see if structural, panel or any other MIG brazing is necessary. No decision has been reached on if the upcoming I-CAR MIG brazing course would be required for ProFirst shops, though it’s recommended for those businesses. Honda was a major proponent of the I-CAR-developed course, which will teach not only about MIG brazing Hondas but brazing on other OEM vehicles as well. Apparently, it and the recently updated “MIG Brazing Theory” from I-CAR can’t come soon enough. Tobie said the technique still is alien to much of the industry — to the point where “Huh?” and “What’s that?” were common answers when he asked collision repairers they’d done any MIG brazing. No decision has been made as to if the Honda-I-CAR MIG brazing course would be required of ProFirst shops. The article has since been adjusted to reflect this. The I-CAR MIG Brazing Hands-On Skills Development course was developed by I-CAR, though OEMs like Honda (which pushed for such a course) assisted on the content.